The reliable handset tailored to meet families' daily needs Busy lives demand a reliable, well-equipped handset. The ideal solution for active families: the Gigaset C59H. It features a best-in-class, large TFT colour display, an easy-to-use modern user interface and brilliant sound quality with HSP™. For even more convenience and simplicity in daily telephony, it features like a baby alarm, programmable VIP ring tones and a talk time of up to 12 hours. 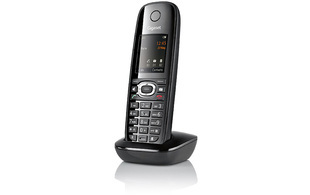 It's easy to register the Gigaset C59H to any compatible base station. If you pay attention to the environmental and financial impact of your energy use, you'll be pleased with the Gigaset C59H's radiation-free and energy-saving ECO DECT technology. The Gigaset C59H offers the perfect fusion of quality technology, refined design and easy-to-use features - the ideal handset for any family's living room.